Further to Sir Lance's blog on whether it was cold enough outside, watching the Saturday NFL Round Up programme the other week.... I came across an amusing diversion called The NFL Top 10 which was a list of the greatest bad weather games of all time. It was a blast. There was the Freezer Bowl between the Cincinnati Bengals and the San Diego Chargers in 1982, when the wind chill factor amounted to a reading of -59F. Side judge Dave Parry said he got so close to one of the pitch side heaters he burned his hair, clothes and eyebrows and didn’t even notice. The next season, New England Patriots and Miami Dolphins played the Snow Plough Game, which was won when Patriots coach Ron Meyer ordered a John Deere Model 314 tractor on to the pitch to clear a path for his place kicker John Smith to make the only score of the game. The NFL later outlawed the use of ploughs during a match. 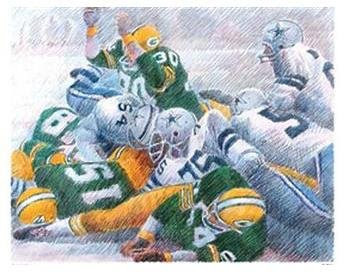 Top spot went to the 1967 Championship Game, or the Ice Bowl as it is known, between the Green Bay Packers and Dallas Cowboys. Not taking wind chill into account temperatures dropped as low as -25F during play, the whistle froze to the referee’s lips and members of the band were taken to hospital with hypothermia. There were other games played in blizzards, some in torrents of rain. 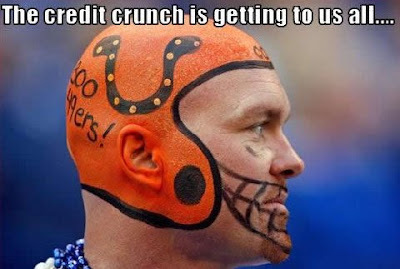 This would have been whiskery ground to NFL fans but, to a novice like me, it was great fun. And I thought of it the other day when bad weather all but wiped out England’s domestic fixture programme. Not because American sportsmen braved worse conditions, but because spectators did. There were 50,861 at the Ice Bowl, 46,302 braved the Freezer Bowl, while 500 volunteer fans received 10 dollars and a free ticket to help clear the stands for the thousands who watched the Snow Plough game. America, as we know, has some highly litigious citizens. A cup of coffee served at the wrong temperature can turn into a million-dollar law suit. So how is it that these legendary bad weather matches — and one of the NFL top 10 dated from 2001 — went ahead when in England a frosty pavement within a five-mile radius of the stadium provokes a telephone call to the Premier League? I've often wondered why they play the Superbowl Final in the depths of Winter, ( so it doesn't clash with Baseball i suppose ?) But could it be that followers of American sport accept a degree of personal responsibility when going to a game? And is it not also true that, given the opportunity and less official interference, ours would, too? Excellent post! First off, it's because we play REAL football! LOL! NOTHING gets between an American and his SPORTS! Secondly, the Bad weather football games are becoming less of an issue, on the field anyway, as most successful franchises are moving to retractable roof stadiums. Third, baseball, America's original past time...has dictated when all other Sports are played. Baseball may not be number 1 anymore, but it still wields a BIG BAT, even without steroids! Fourth, what the English call a Pitch, we call the Gridiron! Perhaps if you came up with a more manly name for the filed, you'd play in bad weather too! LOL! "The Frozen Tundra of Lambeau Field." What? You all don't play Cricket in the snow?